Yeah, I know most of you are sitting with some wicked-cold weather right now, (don't hate me) but here in central Arizona the weather has been kind to us . . . So kind that I was able to grow enough Black Beauty Zucchini to make our Grand's favorite hot dog relish! With the help of 2 young taste testers, A. J. and Hannah, I believe I've designed the perfect hot dog relish to satisfy our family's discerning tastes! 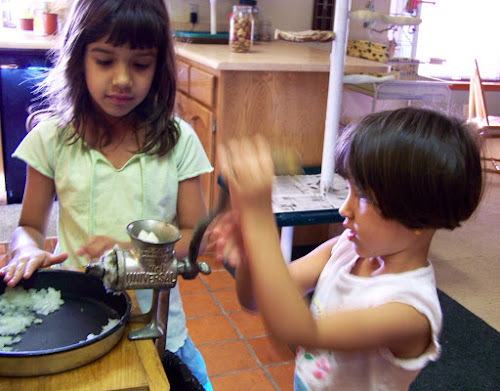 This photo was taken 2 years ago ~ AJ and Hannah grinding onions for relish using their Great-Great-Great-Gram's food chopper! We're picky about our relish . . . It can't be sweet . . . The acid must be just right, and we want to taste the veggies and seasonings! No. 1 Universal Food Chopper ~ patented October 12, 1867! 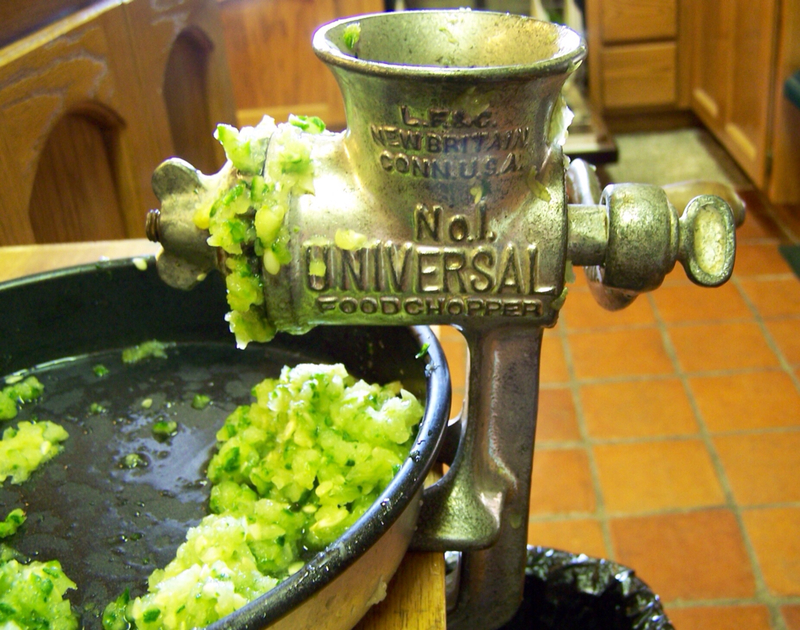 This old food grinder is one of my most prized possessions because it's not only a working antique, but my Great Gram prepared food for her children (my Gram), and grandchildren (my Momma), and me! And, I'm preparing food for my children and precious Grandkids! 6 generations of our family's women preparing food for their families . . . so far! Isn't that amazing?! I love the feel of the wooden handle, worn smooth with use, and it reconnects me to the incredible women in my life, who have passed on! 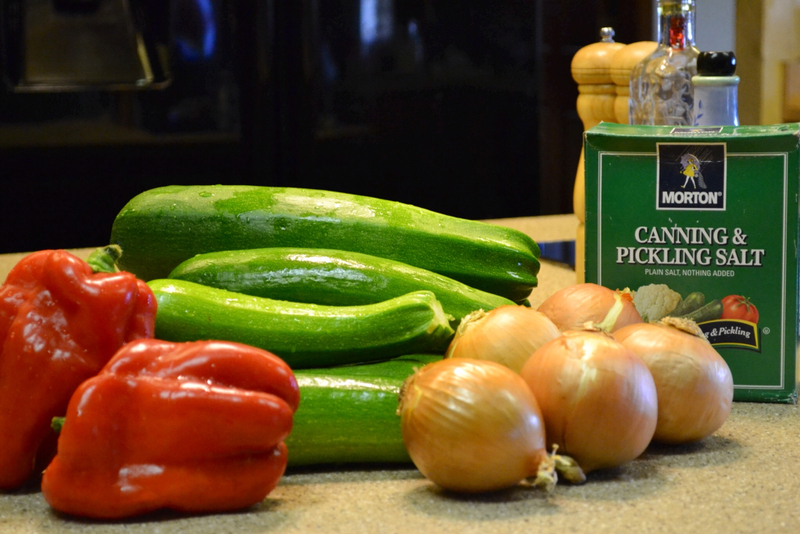 Zucchini and peppers fresh from the garden . . . In December! A-M-A-Z-I-N-G! 4 cups course chopped onions (5 medium). 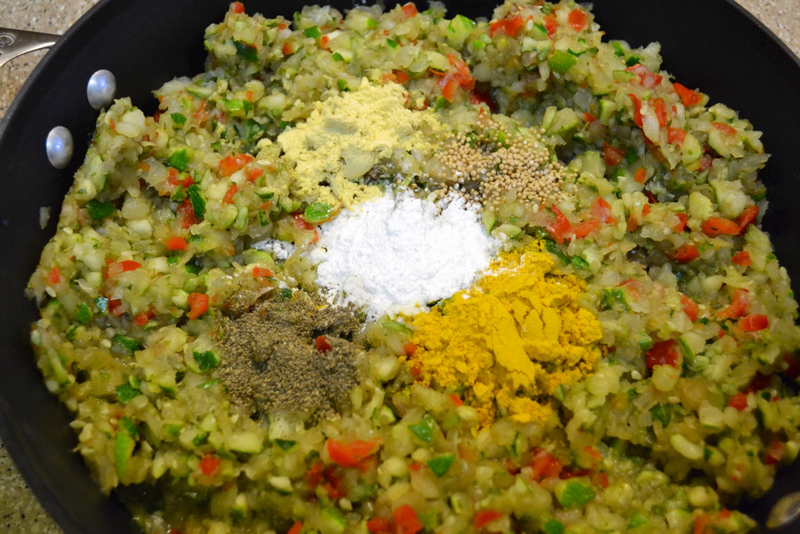 Mix ingredients together in a large bowl; cover and let it set overnight. Rinse with water, and drain well. 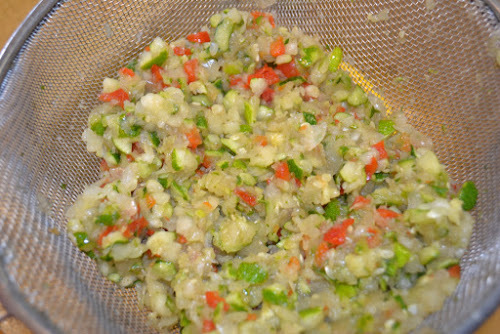 Rinse and strain raw relish. Add seasonings, cornstarch, sugar and vinegar; cook on LOW heat 30 minutes. 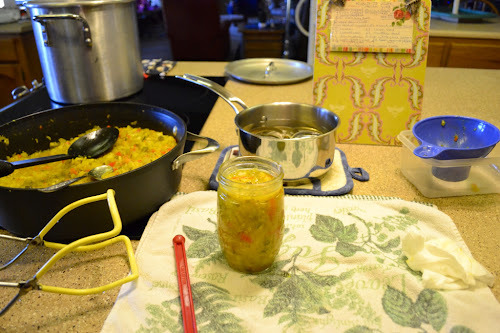 While relish is simmering prepare canning jars, lids and rings. I like to sterilize my clean jars in the hot water bath before filling. 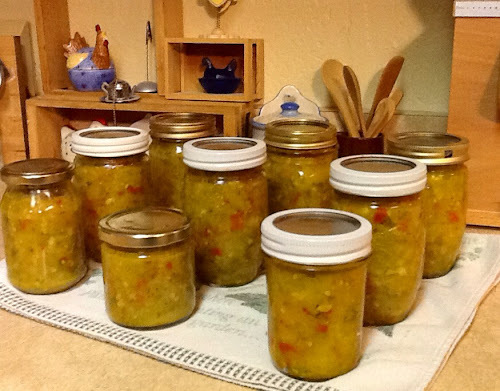 Fill jars with relish, leaving 1/2-inch headspace. Wipe jar rims, adjust lids and rings. Process 15 minutes in a hot water bath (5 minutes extra for over altitudes over 1,000 feet). Place hot jars on a towel to cool slowly in a draft free spot. 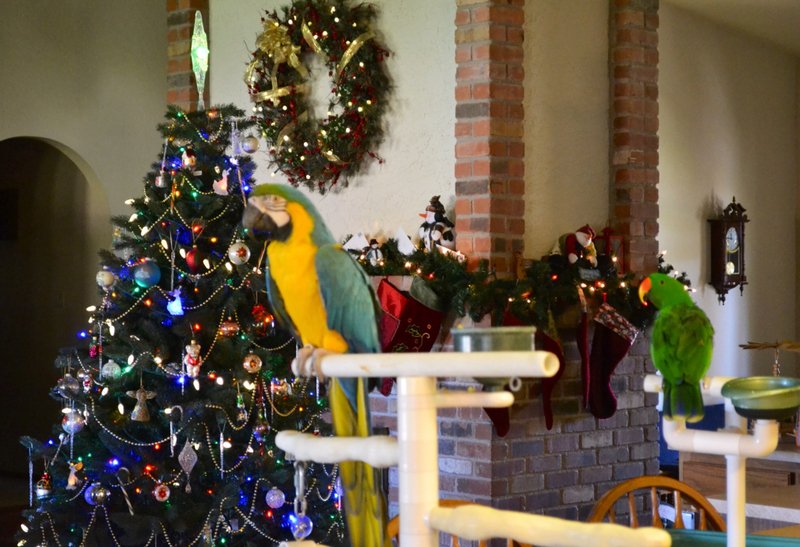 Libby and Evergreen keeping an eye on the relish while it's cooking! Enough relish for Will, me and the rest of our family to enjoy! 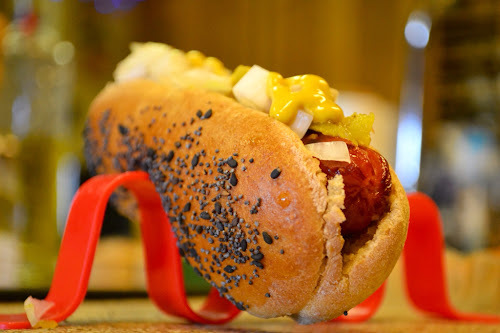 An all-beef, preservative-free hot dog ~ grilled to perfection ~ atop a homemade bun, with onions, mustard and Kick-n-It Relish! Now that's what we call "GOOD EATS" . . . Over at Julie's!!! Homemade Memories ~ DIY Style!